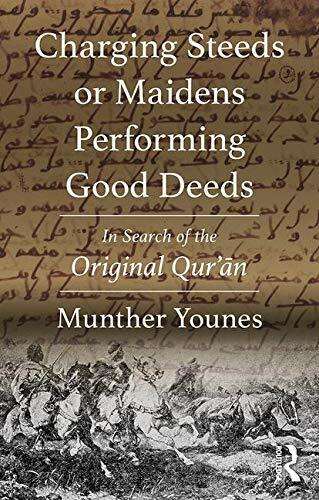 Charging Steeds or Maidens Performing Good Deeds : In Search of the Original Qur’ān brings an important contribution to understanding the development of the Qur’ānic corpus. Through a selection of meaningful case studies, the author convincingly argues for a different interpretative approach to the Qur’ānic text. Taking as a starting point the consonantal skeleton of the holy text, known as the ‘Uthmānic rasm, and offering a critical reading of the Muslim interpretive tradition, such an approach produces a clearer understanding of parts of the Qur’ān which have defied Muslim and non-Muslim scholars since the early days of Islam. Certain verses in the Quran have challenged Muslim interpreters as well as modern scholars. In some cases, the verses do not seem to fit the context ; in others, they violate standard rules of Arabic grammar. Some in the Muslim tradition take these verses as evidence of the miraculous nature of the language of the Quran whose secrets only Allah knows. A number of modern scholars, particularly in the West, have tried to understand them by reference to Semitic languages, particularly Syriac and Hebrew, or by reference to Christian and Jewish traditions, which had a substantial influence on the language of the Quran. Some scholars have gone so far as to offer alternative readings of the Quranic text or to propose emendations. Applying the tools of modern linguistic analysis, we will examine a sample of these passages, read their standard Muslim interpretation (tafsîr), identify grammatical and textual problems and propose alternative interpretations that arguably produce a semantically more coherent and grammatically sounder text.